As Cassini’s tour of Saturn comes to a close, NASA’s getting a bit nostalgic. Yesterday, the space agency released a photo of Saturn’s North pole the doomed spacecraft took on April 26th—the day it started its Grand Finale. 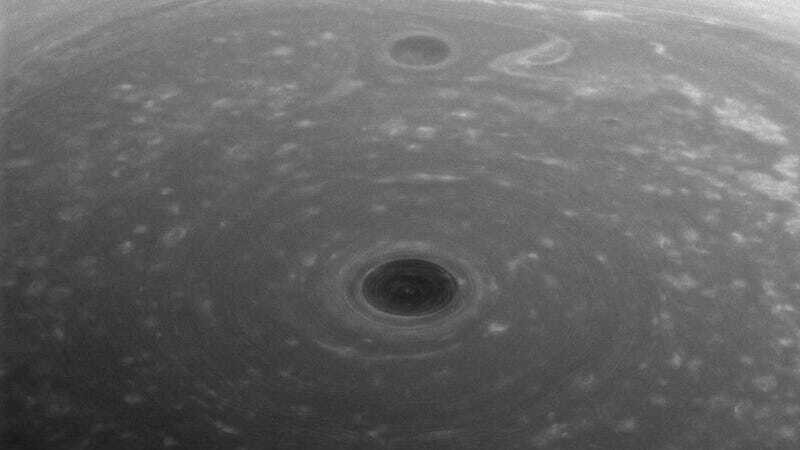 It’s almost poetic to have a photo of Cassini staring into the void before it perishes within it. According to NASA, Cassini snapped the picture when it was hovering 166,000 miles (267,000 kilometers) above Saturn. The planet’s North pole is notorious for the 1,250-mile-wide storm it harbors, which Cassini has photographed many times. The hexagonal jet stream surrounding that monster cyclone creates a unique visual that’s absolutely haunting at any vantage point. Cassini has only three orbits left in its 20-year-long journey, the next of which starts today. On its final dive on September 15th, it’ll plunge itself into Saturn’s atmosphere with its antenna pointing toward Earth, transmitting everything it can until the atmosphere overpowers it. So long and thanks for all the pics, Cassini.